NEW! 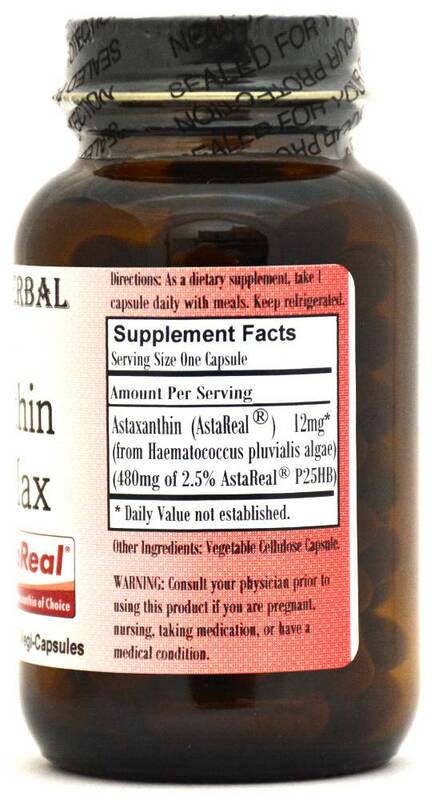 Barlowe's Herbal Elixirs now offers Astaxathin Vegan Max 12mg by AstaReal®. Each capsule delivers 12mg of Astaxanthin which is the maximum recommended dosage for immune system, joint, skin, brain and eye health. Astaxanthin is one of the strongest anti-oxidants known. Barlowe's Astaxanthin Vegan Max is Vegan and Vegetarian. The soft gel versions of Astaxanthin cannot say that! Bottled in Glass! No Stearates! No Fillers! No Junk! NEW! 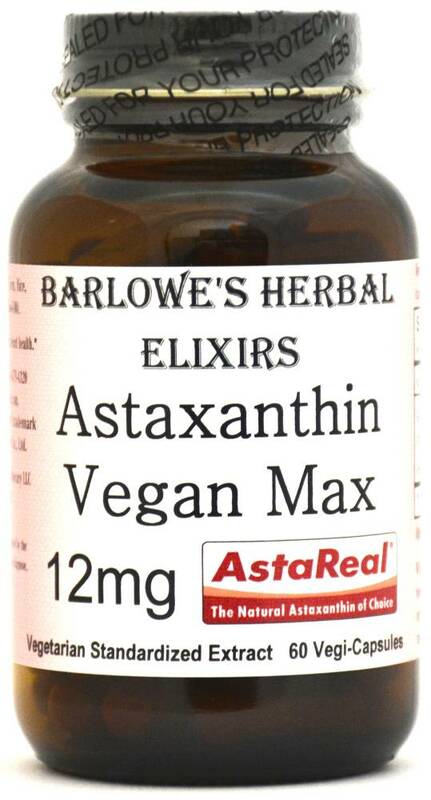 Barlowe's Herbal Elixirs now offers Astaxathin Vegan Max 12mg by AstaReal®. Each capsule delivers 12mg of Astaxanthin which is the maximum recommended dosage for immune system, joint, skin, brain and eye health. The Certificate of Analysis (COA) of this product is shown above. Astaxanthin is one of the strongest anti-oxidants known, and it's really good to utilize for increased endurance and for rapid recovery from strenuous exercise. Studies have also shown that it is a superb supplement for brain health. Barlowe's Astaxathin Vegan Max is Vegan and Vegetarian. The soft gel versions cannot say that! This product should be refrigerated upon receipt to retain utmost potency. The bottles are kept refrigerated in our facility until ready for shipping. Bottled in Glass! No Stearates! No Fillers! No Junk! AstaReal® are pioneers in microalgae cultivation. In the early 1990s, they developed a highly advanced and one-of-a-kind technology using specially designed photobioreactors to cultivate the microalgae Haematococcus pluviailis. Thanks to this unrivaled technology, they are able ensure hygienic conditions and an environment that allows the culture to reach unsurpassed levels of maturity. The result is superior natural Astaxanthin products with the highest quality, stability and concentration available in the market. 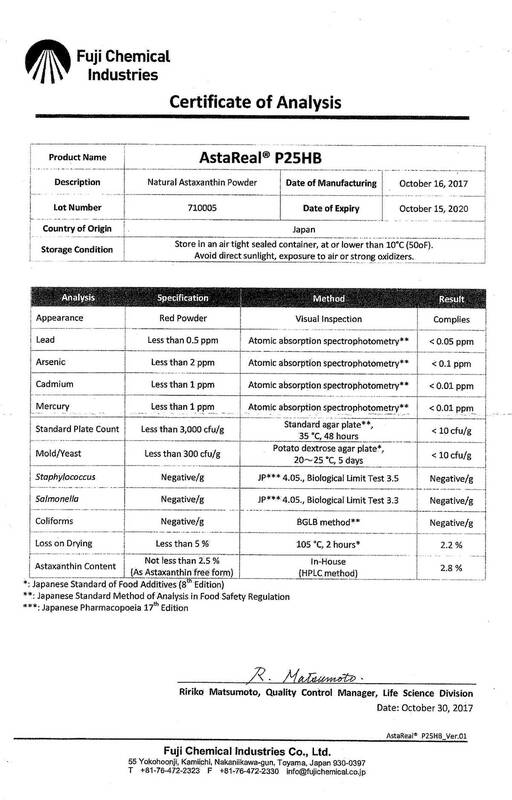 Astareal® Astaxanthin is both Kosher and Halal certified, and their two facilities are cGMP, HACCP, and ISO9001 certified. DIRECTIONS FOR USE: Take one capsule daily with meals / with dietary fat as this helps increase absorption. For some people, dosage may need to be increased as results and usage amounts vary based on body type and weight. Product should be kept refrigerated for utmost potency.